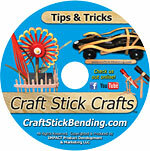 ﻿ Craft Sticks Bending & Craft Stick Crafts How to DVD. How-to DVDs - Purchase and sign up for new releases. 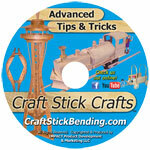 Designed as our basic bending, How-to DVD. 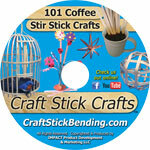 Shows how to bend, mold, shape, twist, craft sticks, popsicle sticks, tongue depressors for the purpose of making toys, gifts, arts, crafts and more. These same techniques will be used later in all of our other How-to DVDs. This video is the foundation to all our other videos. All family safe, no steam, no boiling, and no chemicals. 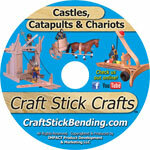 Much like the medieval DVD, but designed around families building more pioneering days to modern days models and play sets. Once again using the basic and some advanced skills we go right into making wheels for wagons, fencing, stables and barns with roofs. All family safe, no steam, no boiling, and no chemicals. 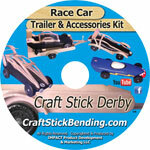 instructions and materials to make a race car trailer, to show off your car or pull behind your car. 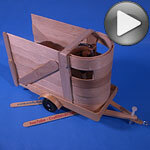 Supplies and How-to DVD included to make such toys as a Pinewood Derby car trailer, Beyer horse trailer, a log trailer and more. This DVD is the start of your creative engine to convert and combine everyday toys and craft sticks. 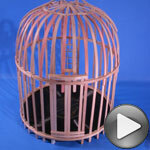 Why not convert that old RC car/truck under the bed, to a mobile siege tower.